It seems from a number of emails I've received that many people didn't see or didn't understand my point that buying a D600 is like placing a bet. So let me explain. In most everything there is a risk/reward continuum. Take more risk and you increase the potential reward. But risk is risk. Sometimes you don't get the reward: that's a risk. If I offered you a 49% chance to get US$100 if you gave me US$50, what would you do? Well, the smart person wouldn't take me up on the offer. You will win almost half the time. It's basically a US$50 bet on heads or tails with a 2% give to the house: that's gambling. As I noted, the D600 is now selling—especially refurbished—at what a year ago would have been regarded as extremely good prices for a full frame camera. Okay, not just extremely good, but nearly insane prices. A refurbished full frame D600 currently sells for far less than a new DX frame D300s. So, is a 19% discount enough to get you to buy? Well, the 19% discount is the reward for waiting (27% discount if you select refurbished). The risk is that you might get a camera that will have to go back to Nikon for repair. Early on in the D600's production cycle, that risk appears to have been very high, but it's apparently not zero for products you can get off a shelf today. This is one of the problems with trying to figure out whether to buy: what's the risk? You know the reward, but you can't gauge whether the risk is worth the reward. I don't have an answer to that other than to say that pretty much throughout the life of the D600 I've received emails from people who had just bought the camera and had either debris or splatter issues with it. The volume of those went down over time to the point where they're fairly rare now, but I don't know if that's because the people who read my Web site were all early adopters, or sales of the D600 are considerably off, Nikon managed to fix the problem in the factory, or people are just getting tired of complaining. The D610 introduction, as I noted, implies that Nikon just wants this problem behind them, so the public perception must be that the D600 is a problematic camera no matter when it was made. Nikon's official response to people asking about why the D610 was necessary is "The D610 was released in order to respond as quickly as possible to the demand for a faster continuous shooting rate and the addition of a quiet continuous shutter release mode. The shutter in the D610 has been improved so that it supports an increase in the continuous shooting rate from 5.5 fps in the D600 to 6 fps in the D610." Gee, I wasn't aware of a big demand for a half frame a second increase in speed. But it's nice to see that someone in marketing understands what "spin" is and is trying to practice it. But apparently that person didn't actually read Nikon President Kimura's recent message: "we need to question our ability to offer truly innovative functions and performance." A half frame a second is not innovative performance. A quieter (but still not quiet) shutter isn't innovative function. If you're going to try to spin something, you shouldn't contradict the boss. Meanwhile, the more I look into specific cases of D600 shutter problems, the more intriguing it becomes. I wrote earlier that I wasn't aware of any fixed shutter that later needed replacing. I now have documented cases of three, including one where the shutter was replaced twice and still failed. As is usually the case, that camera was completely replaced on its third trip to NikonUSA repair (if you live in California, that state's lemon laws basically dictate that). But more interesting, I've been looking at a lot of blue skies and white walls lately. It seems there are two different types of problems visible with D600 cameras: excessive lubricant splatter, and excessive debris build up. The spots are semi-transparent, tend to be large and either circular or slightly elliptical in nature, they sometimes have slightly more transparent centers, and the edges are sometimes not well defined. 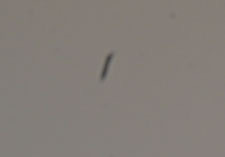 This particular D600 appears to be throwing lots of excess lubricant towards the sensor. To clean splatter well, you need to use a non-alchohol solution, such as Visible Dust's Smear Away. Unfortunately, a side effect of using a detergent based fluid like that is that you have a tendency to leave smears. Which you get rid of by letting the first cleaning fully dry, then do a methanol-based cleaning. The spots have very dark middles that taper off towards the edges, they tend to be irregular in shape, and with the D600 often very irregular (think comets and asteroids). Some of these debris spots are so big that just blower brush cleaning moves them off the sensor area. But that doesn't mean they're out of the mirror box; they might return rapidly. Clearly round, with a dark center that tapers to the edges. 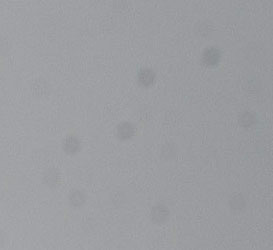 This could be a small debris particle, too, but generally if you have small amounts of dark round objects in bright areas like this, it's more likely just common dust and not something shed by the shutter.  To repeat, I'm seeing some D600's with splatter, some with debris, but few with both. Nikon seems to be repairing shutters for both problems. So what's the reward? Lower prices. What's the risk: the camera may need to be repaired, which will cost you time without the camera and shipping and insurance to Nikon. Some cameras might need multiple trips.